EMC Technologies: Custom Wired & Wireless Functional Testing - EMC Technologies Inc. 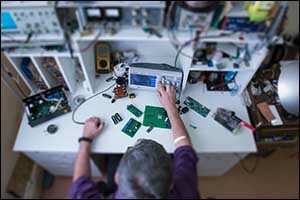 The consumer electronics industry is a massive influence on the electronic test industry, as developers look for new ways to create functional test fixtures that will satisfy the ever-changing needs for testing. EMC Technologies works with many different types of industries, and we have found that through our experience with so many unique clients with challenging demands, that we are able to stay on top of the latest technology trends and requirements. Wired and wireless functional testing, as well as RF functional testing and interface test adapters, are used to create custom solutions for our customers. While wireless functional testing is not a new idea, it still really has no equal when it comes to the testing of high node-count complex printed circuit boards (PCBs). There are many advantages associated with choosing functional test fixtures that can accommodate complex boards, including greater signal fidelity, reduced signal crosstalk, increased capabilities for the testing of low-voltage or multi-logic modules, and increased debug time. While the cost for advanced testing is much higher than what is required for more simple “off the shelf” solutions, a solid return on investment is obtained to cover the additional cost over time. Today’s electronics have become increasingly smaller, yet even more complex than they were just a year or two ago. As a result, testing requirements have also become more demanding. EMC Technologies works with each customer to find the best solutions for wireless functional testing to meet their needs. By creating custom, yet adaptable, functional test fixtures, our clients can adapt the testing method to test similar products, increasing cost-effectiveness and making these tools from the electronic test industry even more valuable. Consumer electronics is an industry to watch, as test pads continue to become smaller and more closely spaced, solutions will need to be created to avoid issues like crosstalk or coupling problems. The three methods used for establishing contact between the PCB and the testing equipment include long wire, short wire, and wireless functional testing fixtures. EMC Technologies provides a variety of unique services to our clients to help them maximize their results with functional test fixtures. Our contract services include cable and wiring with Mil-Standard or best commercial practices, contract manufacturing for printed circuit board (PCB) fabrication and testing, and built-to-print test adapters for commercial jet and military products. We also work extensively with engineering and design, electro-mechanical design, machining and prototyping, and PCB design and assembly. The PCB designs that we create for our clients can include requirements that range from a simple double-sided board to much more complex, multi-layer designs. Our designs for the electronic test industry can be accomplished directly from the customer’s requirements or developed entirely by EMC Technologies. Depending on your needs, the PCB designs are available in either PADS or Allegro format. Our team uses the design and manufacture of PCBs as an integral component of the ITA for many reasons, including improved signal integrity and repeatability to reduce debug time and create faster, more cost-effective exact duplicates of interface test adapters. Other benefits to design, manufacture, and assemble PCBs at EMC Technologies in-house include better organization of relays, power, and ground busses, improvements with signal conditioning components, and easier maintenance for high-volume testing. If you are interested in learning more about custom PCB design, contact our team for additional information. There are many advantages associated with creating custom functional test fixtures for the consumer electronics industry. Wireless functional testing is an essential part of the electronic test industry, and EMC Technologies can help you find solutions that will work to satisfy your unique requirements for testing. Our design capabilities range from very basic to extremely sophisticated and complex. Our team of engineers works directly with each client to develop custom test fixtures, which helps us to create even more beneficial results to best meet your application needs for R&D, as well as production. If you would like to learn more about our custom services for printed circuit board (PCB) design, fabrication, assembly, and testing, give us a call at 508-672-0808. EMC Technologies is ISO 9001: 2105 Certified and ITAR Registered to best meet the needs of every client we serve. If you would like to get started in the development of custom functional test fixtures with our team, call today or use our online contact form to reach out to our sales team.